Preheat the oven to 350F. Place coconut oil on bottom of tin. Combine almond meal, teff flour, baking powder, and salt in a bowl and stir with a whisk until well combined. Separately, combine the maple syrup, mashed banana, almond milk, egg whites, oil, and vanilla extract and whisk until smooth. Add the wet mixture to dry and mix well with a rubber spatula. Spoon the batter into bread tin, filling about three quarters full. Bake 45 minutes, then let cool on a wire rack for 15 minutes. In large saucepan, bring the coconut milk and 3 cups of filtered water to boil over medium high heat. Add oats, quinoa, syrup, cloves, cardamon, and salt and cook, stirring occasionally for 15- 20 minutes. Cover and let stand for 10 minutes. 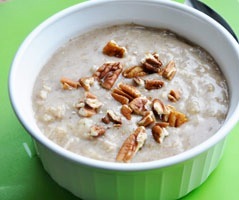 To make marmalade, stir toasted pecans, coconut, coconut milk, syrup, and vanilla together in bowl until well blended. Spoon porridge into bowl and top with marmalade. Bring water and quinoa to a boil in medium saucepan. Cover, reduce to a simmer and cook for ten minutes. Turn the heat off and leave on burner, covered, for another 10 minutes. Fluff with a fork and allow quinoa to cool. Preheat the oven to 375F. Lightly grease loaf pan with coconut oil. Combine orange juice, oil, eggs, vanilla, and orange zest in food processor. Add 2/3 cups of cooked quinoa and puree mixture until smooth. Mix flour, maple syrup, baking powder, adn salt in large bowl. Add raisins and stir. Mix in quinoa orange puree. Pour mixture into loaf pan and bake for 45-55 minutes. Allow loaf to cool. 2.Combine ingredients and stir gently until combined. 3.Fill each muffin tin 2/3 of the way full. Bake for 20-25 minutes. Preheat coconut oil on medium heat in a medium sized pan. Place eggs and milk in a bowl and whip with a fork for 1 minute. Add remaining ingredients to mixture except mushrooms. Stir to combine. Pour mixture into prepared pan and top with sliced mushrooms. Allow to cook for 10 minutes. At 8 minutes turn your oven broiler to low and sprinkle goat cheese on top of the frittata. Slide under broiler for about five minutes, or until it begins to brown. Preheat the oven to 350 degrees. 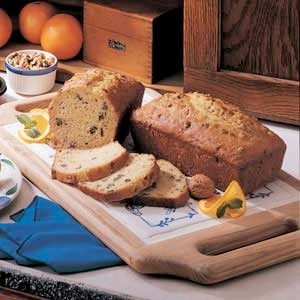 Lightly oil a 9×4 inch loaf pan. Combine the flax-water mixture in a large bowl, set aside for a couple of minutes. Add the sugar applesauce, pumpkin puree, vanilla and oil and stir until combined. Sift the flour, baking powder, baking soda, cinnamon and sea salt in a medium sized bowl. Add the wet mixture to the dry mixture and stir. Add walnuts. Pour batter into the prepared loaf pan. Place in the oven and bake for 60 minutes or until tested with a knife. Let cool in pan on a wire rack. Cut into slices and enjoy. Begin to heat a 10-inch skillet over medium heat, add in coconut oil. Whisk the dry ingredients together in a medium-sized mixing bowl. Add the wet ingredients. Whisk together well. Make sure your pan l has a little coconut oil on the bottom. Use cup measure to pour the batter into the pan. (half cup). Cook for 60 to 90 seconds on one side, then flip and cook for 30 to 60 seconds on the second side. Add about 1/2 teaspoon of oil in between pancakes. Adjust the cooking temp as needed. For garnish: heat a 10-inch skillet over medium heat. Add coconut oil. Once the oil is melted add your apples and saute far a few minutes, stirring frequently. Then add the maple syrup, apple cider spices and salt. Stir and let simmer, uncovered, stirring occasionally, for about 10 minutes or until apples are cooked as desired. In a medium sized mixing bowl, whisk together the flour, baking powder, cinnamon, turmeric, and salt. Throw in the diced apple and mix well. In a small sized mixing bowl, whisk together the apple juice, coconut oil, applesauce, almond extract, eggs, and coconut sugar. Pour the liquid ingredients on top of the dry ingredients and gently fold until all ingredients are just incorporated. Spoon the fairly thick batter into the prepared muffin pan, filling each three-quarter full or all the way full if you like big muffin tops. The batter should not be very runny at all, but if you find that it is crumbly and it’s not coming together, add a tablespoon or two of apple juice until you can work with it. Sprinkle the chopped walnuts evenly on each muffin top. 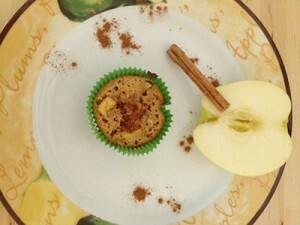 Stir together the coconut sugar and cinnamon and sprinkle all over the muffin tops. Bake for about 20 minutes or until a toothpick inserted in the middle of a muffin comes out clean. Put in in blender and blend away!